Ripe or overripe bananas sitting in your fruit basket means it is time to use them in your baking! Banana bread is perfect for breakfast and baking a cake is even better but a Chocolate Banana Cake is the ultimate. If you are looking for a delicious and super quick dessert or to enjoy at tea time then this is what you should bake just the way I do. This cake combines the sweetness of ripe mashed bananas with cocoa powder and makes it so full of chocolate that anyone who bites into this moist cake will take a while to realize that it has bananas. It is the oil which gives the cake a moist texture, tender crumb and keeps the cake soft when refrigerated. 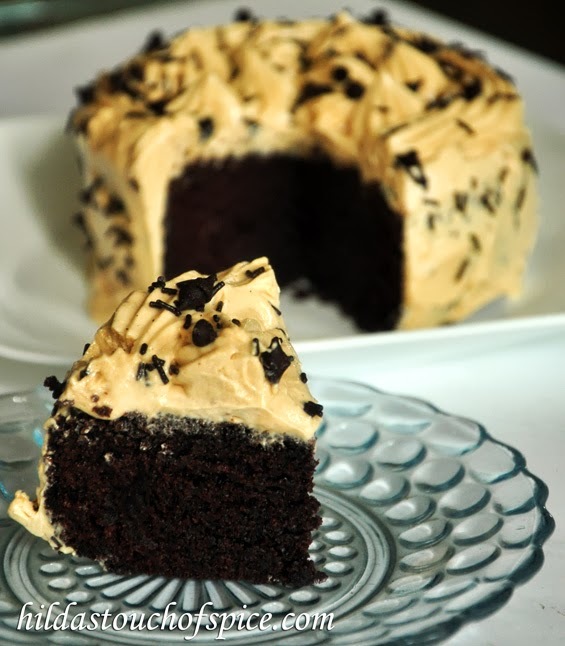 The Peanut Butter Cream Frosting is perfect for this Chocolate Banana Cake. The frosting is soft, fluffy. It is buttery but not greasy, not too sweet and is just right for this cake. This frosting can be prepared in advance and refrigerated. You need to bring to room temperature before using it. Peanut Butter and Bananas are nutritious and healthy. They are excellent for growing and school going children. Everyone can truly enjoy this combination in a cake. You can even consider baking this for a child’s birthday party. 1 ½ tsp. Baking pwd. Grease and line a 23 x 33 cm baking pan. In a large bowl, sift and whisk flour, cocoa powder, sugar, baking powder, soda bi-carb and salt. In another large bowl, whisk eggs, mashed bananas, water, milk, oil and essence. The batter will be thin. Pour the batter into the prepared pan and bake for 40 mins. or until a toothpick/skewer inserted in the center of the cake comes out clean. 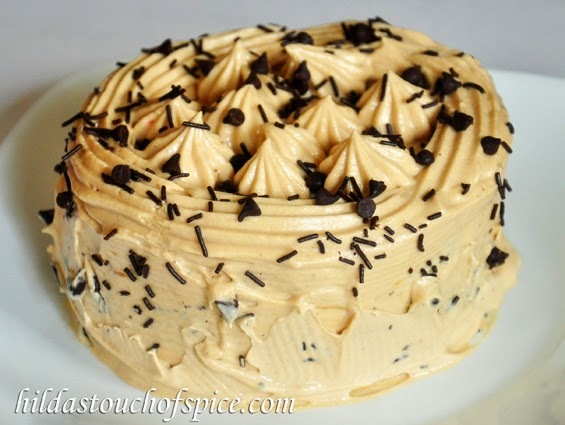 When completely cooled, ice the cake with Peanut Butter Cream Frosting. Slice or cut into wedges and serve. Place over a pan of simmering water and whisk continuously until the sugar is dissolved and warm to the touch. Beat the mixture with an electric hand whisk on medium speed until fluffy. This will take approx. 15 mins. Raise the speed to high and beat until fluffy peaks form; approx 5-7 mins. Add vanilla essence and peanut butter, a tablespoon at a time and beat on medium speed until fluffy. Frost the cake and pipe designs on to the cake. Thanks. It is indeed delectable! Well, I would like to know your name.